Blue Box Design Managing Director Duncan Robertson said: “This new 20,000 sq ft facility at Broadleys Business Park greatly improves our ‘speed to market’ for our customers by reducing the packaging development cycle time from concept to delivery. It will expand our production capacity significantly and enable us to retain highly skilled staff whilst creating new jobs in Central Scotland. Donald McLaren, Managing Director, McLaren Packaging, said: “Our decision to invest in this facility has been influenced by the continued success of the Scotch Whisky industry globally and the demand for premium packaging produced sustainably. The sum invested in the new facility is the single largest investment made by the company in 20 years. 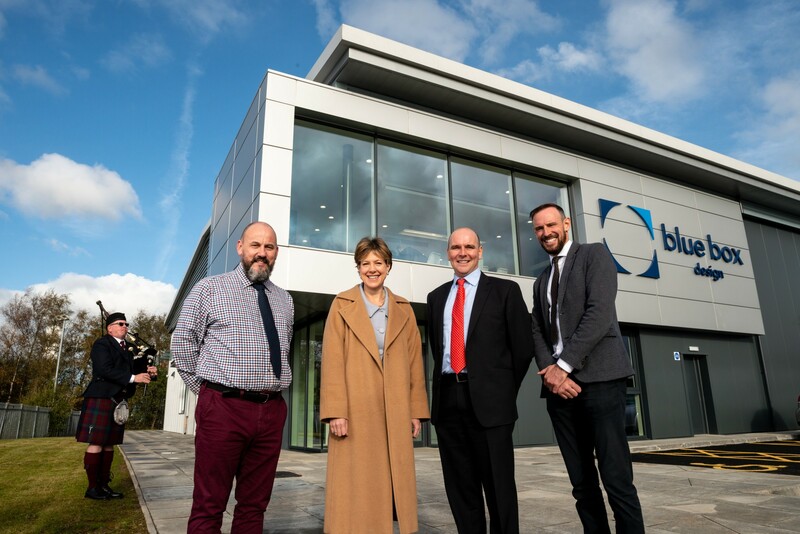 Speaking at the official opening ceremony, Karen Betts added: “Blue Box Design’s new facility reflects the ambition of the Scotch Whisky industry to harness future global growth. The sort of investment you see today at Blue Box Design is illustrative of the investment going into the industry and the critical companies that make up our supply chain. The new facility was in inspired by McLaren Packaging’s late founder and packaging innovator Jim McLaren.